Over the years, I have changed bands on the 10/80 meter gearmotor antenna built in my workshop, with a simple DPDT center off spring-loaded toggle switch controlling movement of the 10/80 meter HF gearmotor antenna that resides on my mobile as seen in the photo. Recently I added a 12VDC reversing polarity control unit with a keyfob transmitter that has two buttons to control the up and down motion of the antenna. The left button runs the antenna in one direction and right button runs the antenna in the opposite direction. 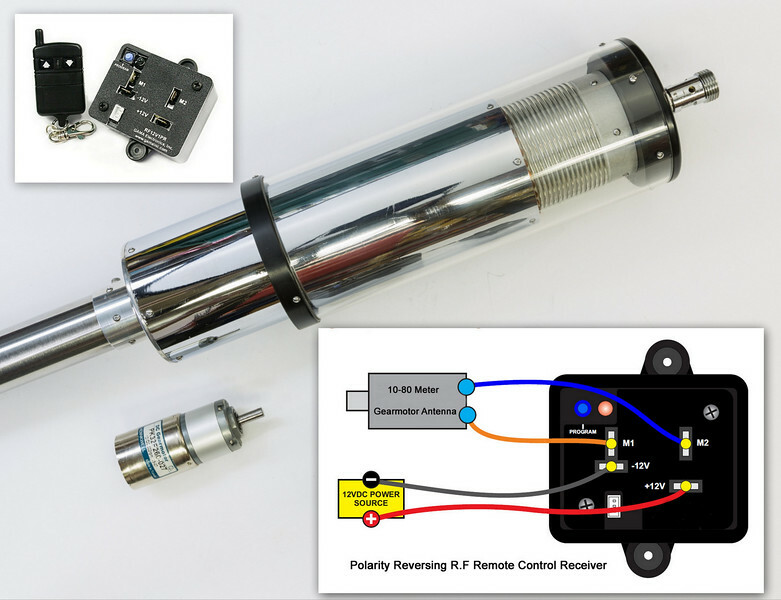 The transmitter allows for rapid travel between bands, and then the transmitter allows for easy bumping of the gearmotor to arrive at the optimum location on the antenna required for the frequency of choice you will operate on.